The World Cup started a few days ago, Mr Kim has met Mr Trump and apparently we are postponing another global armed conflict. I guess we can say the devil is losing this battle and all because our awareness has been raised lately. We are gradually investing in empathy rather than media displays of vulgar superiority. Just help sort out the plastic epidemics by buying less plastic-wrapped products, by demanding a serious environmental consciousness from your wholesalers and from yourself, and we must have a dandy world to show our grandchildren. Yeah, the devil must not have the upper hand. Unless, of course, we are talking about autoimmune diseases such as Sjogren's syndrome, Lupus, and the whole rheumatic paraphernalia.... and so on and so forth. When it comes to anti-inflammatory issues we must give the devil a chance. OK, now that those who are crazy religious freaks and do not listen/read 'til the end are already painting banners stating God hates homosexuals and bashing biological evolution theories, let's focus on the devil for a moment. 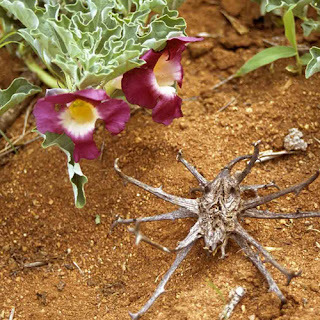 But merely on its claw, the Devil's Claw (known by the botanists as Harpagophytum procumbens). You know, I got one of those emails that is so paradoxical and disturbing (a bit like when Jesse Lee Peterson goes on TV rebranding racism) - bear in mind I haven't taken a stance here. This is not a political blog and I do not dispute idiosyncrasies unless I am asked my opinion on it. 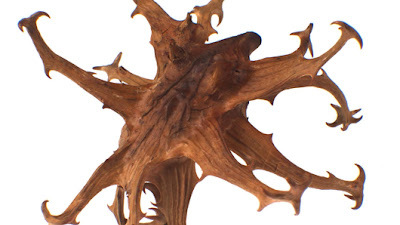 But on such occasion the email I was sent explained that this Devil's Claw was the Father of all Miracles and would really fix any Sjogren's, Lupus, Cushing's etc etc etc patients suffering with pain and inflammation to a degree that Hell would become a vast garden of scented flowers. I had to search the web for articles that would clarify all my concerns and ease my doubts. I ended up finding a video on YouTube, by a certain Dr. James Meschino, that pretty much throws a flaming scare alarm on the lenient use of this plant. Hence, I decided to review a few articles just to be sure that this product can actually be used for treating certain autoimmune diseases with an inflammatory profile. Huge disclaimer here - please ALWAYS resort to your medical doctor or pharmacist for they are the ones who know about your medical history, and use this information for educational support (Each Case Is a CASE!). 4) and that harpagosides are believed to hold powerful anticoagulant effects, and for that matter can reactivate or aggravate ulcers, thus should not be combined with other anti-inflammatories (non-steroidal or steroidal ones), nor with anti-coagulants (even if new generation ones). The risk is simple to understand and serious in its own nature - INTERNAL BLEEDING. Not all molecules show the same anti-inflammatory potential, as shown by Fiebich et al (2001)  who conducted a very interesting study using a Devil's claw commercial extract to inhibit lipopolyssacharides of bacterial nature. In fact, McGregor et al (2205)  also confirmed such, a few years later, when attesting the pharmacological/therapeutic potential of this plant, especially the role of the iridoid glicosides present in its list of constituents (namely harpagoside, procumbide, harpagide, and the 8-para-coumaroyl-harpagide). But warnings were simultaneously published as to the limitations imposed by the test models used. Well, in regard to toxicity, al-Harbi et al (2013)  subjected mice to different official treatment protocols (as suggested by the World Health Organisation): The chronic toxicity study used 100 mg/Kg/day (representing 1/5 of the pharmacologically active dose) administered for a period of 3 months, and focusing on vital organ weight variation, external general symptoms of toxicity, and body weight changes and mortality (up to the end of the trials and not for long-term periods); and concluded that the subjected cohorts experienced low toxicity. The same study also covered acute toxicity where the subjects were presented to oral doses (0.5, 1 and 3 g/Kg body weight) of the drug suspended in water. This time the analysis focused on autonomic responses, motor activity and central nervous system excitation. One interesting finding is related to 0.5 g/Kg treatment of Devil's claw that significantly reduced blood glucose levels when compared to untreated cohorts. However, these were merely preliminary studies and only point towards general assumptions for future studies to consider. The incidence of musculoskeletal disorders responsible for disabling many people's lives is high, and any possible natural treatments with pharmacological potential must be analysed for future remedies. Brien et al (2007)  compiled a review on the topic that pointed towards safe use of Devil's claw in comparison to non-steroidal anti-inflammatories in reducing pain associated to this disease. The same positive results were also supported by Warnock et al (2007)  that focuses their analysis on a number of rheumatic diseases (including arthritis) and a single group of 259 patients for eight weeks with tolerance, liver tests and blood analysis performed. But the main concern could not be answered to, meaning its safe use is still not guaranteed especially because there are no long-term safety assessments and the populations studied are quite limited in number. Because I could not find many articles that supported the allegations of Dr. Meschino (I am not saying there isn't any, I am just saying I couldn't find that many) I am not going to say he isn't right. One think I am certain of is that the jury is pretty much still out there on the safety of this plant. But its pharmacological efficacy and range of applications is very much attested. Nevertheless, what the doctors suggest is almost common sense for when we are unaware of the mechanism of action [MOA], as it is the case for the Devil's claw herb, and the MOA of many other complementary and alternative medical therapies . One thing is certain, because of its bitterness it will indeed affect stomach acidity, ergo affecting drugs like proton pump inhibitors, H2-blockers (also known as H2 receptor antagonists) and the like, used to reduce stomach acidity. This is the reason why it might be involved in the worsening of ulcers. However, the safety assessments I was able to find are limited in numbers of populations studied and even range of observations performed. Having said that, I found a really nice piece of document that is 69-pages long, written by the European Medicines Agency  (access here) that I will eventually read and try and summarise for you. Bear in mind this document covers many different aspects like medicinal application of this plant, to clinical and non-clinical data, clinical safety, pharmacovigilance aspects and what interests you the most, being the risk-benefit assessment. Once again, after a very brief reading (not thorough at all) I could only find a drug interaction study  supporting the allegations of Dr. Meschino, but I still have to lay my eyes properly on this document. The article by Patel et al (2008)  apparently (as I could not pay for it, but if you want me to read it just be my guest and send me the money :DDDD) suggests putative interactions with anticoagulants (e.g. warfarin) leading to gastrointestinal bleeding. There was also another article I found (access here)  but with no listed authors or free-PDF available that suggests that, in practice reports and concerning devil's claw roots exposed-patients, some showed up with upper gastrointestinal disorders. The jury is pretty much out there as I already said, but I am sure I will have to discuss the topic further in the weeks to come. Until then, play it safe. Fiebich, B. L., Heinrich, M., Hiller, K. O., Kammerer, N. (2001). "Inhibition of TNF-alpha synthesis in LPS-stimulated primary human monocytes by Harpagophytum extract SteiHap 69". Phytomedicine, 8(1), pp. 28-30. McGregor, G. Fiebich, B., Wartenberg, a., Brien, S., Lewith, G., Wegener, T. (2005). "Devil's Claw (Harpagophytum procumbens): An anti-inflammatory herb with therapeutic potential. Phytochemistry reviews, 4(1), pp. 47-53. Al-Harbi, N. O., Al-Ashban, R. M., Shah, A. F. (2013). "Toxicity studieson Harpagophytum procumbens (devil's claw) capsules in mice". Journal of Medicinal Plants Research. 7(42), pp.3089-3097. Brien, S., Lweith, G. T., McGregor, G. (2007). "Devil's Claw (Harpagophytum procumbens) as a treatment for osteoarthritis: a review of efficacy and safety". The Journal of Alternative and Complimentary Medicine, 12(10). Warnock, M., McBean, D., Suter, A., Tan, J., Whittaker, P. (2007). "Effectiveness and Safety of Devil's Claw tablets in patients with general rheumatic disorders". Phytotherapy Research, 21(12), pp. 1228-1233. Setty, A. R., Sigal, L. H. (2005). "Herbal medications commonly used in the practice of rheumatology: mechanisms of action, efficacy and side effects". Seminars in Arthritis and Rheumatism, 34(6)pp. 773-784. 1st image kindly taken from Harpagophytum procumbens - diseases, [http://flipper.diff.org/app/items/6532], last visited on the 18th of June2018. 2nd image kindly taken from Kew, Royal Botanic Gardens, [https://www.kew.org/science/news/plant-story-devils-claw-found-and-collected-from-botswana], last visited on the 18th of June 2018.